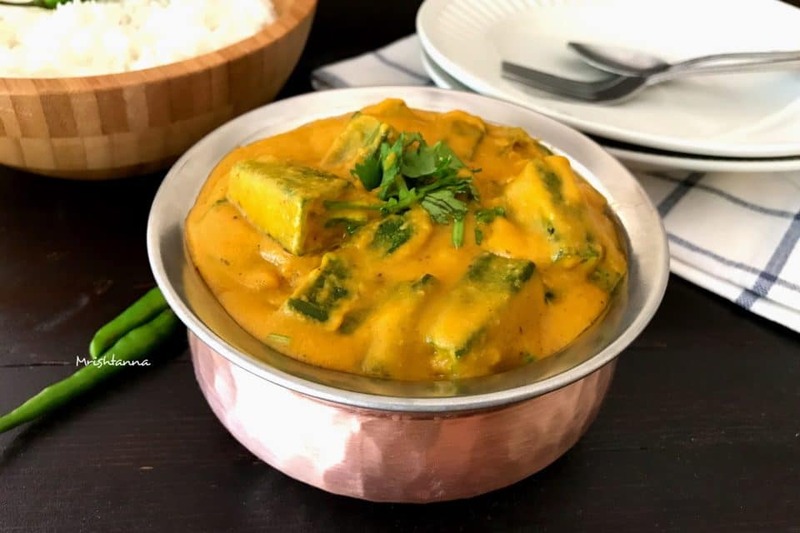 Vegan Okra Curry – Bhindi Masala Recipe ! It was exactly a year ago that I shared my recipe for Okra Curry and I am sharing the same recipe again, with one big change. It’s Vegan! Okra (a.k.a ladies finger) is a vegetable that keeps on giving all summer long. But it also matures very fast during summer, so it is important to look for tender one when you shop for Okra. Try this curry at the height of summer and you will enjoy the best of Okra. This vegan version comes with less fat as well. Finding an alternative for milk was a trial and error process. Soy milk or Almond milk do not fit the bill and Cashew milk offers the best combination of flavor and creaminess. The best part is that there was no difference in taste between last year’s recipe and today’s vegan version. When you try this recipe, one thing you have to watch out for is that Okra tends to become a little slimy sometimes. The trick to get around this is to saute them without salt until they are about half cooked. Like I mentioned before, look for crispy, immature pods when you shop for Okra. There is one little trick to get the tender pieces from the lot. 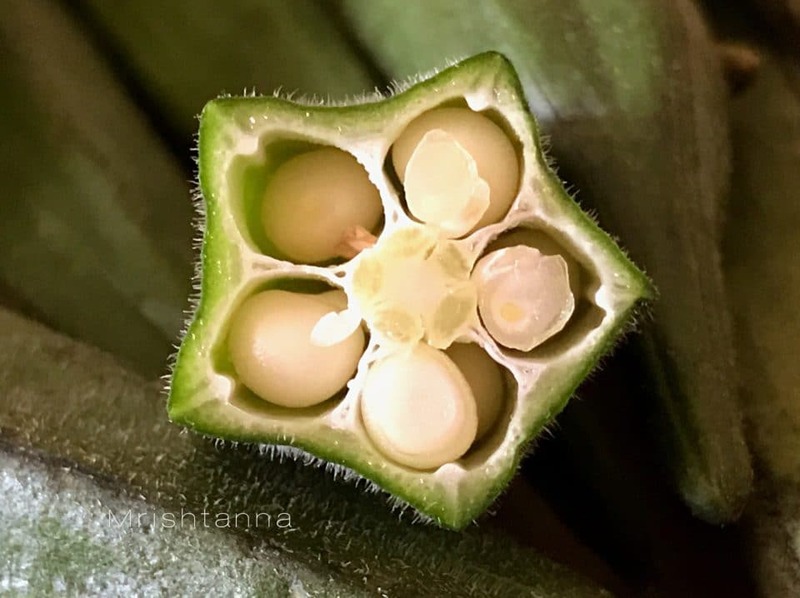 If the tail end of Okra snaps easily, you have a tender one. Okra Curry goes very well with Indian bread or steamed rice. Prep time for this curry is short, as you can see from the video. Try it today and share your experience. You can leave a comment here or on my Facebook page. 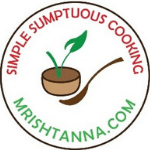 If you prefer getting my recipes directly in your inbox, just hit the subscribe button at the right. This vegan version comes with less fat as well. Okra Curry goes very well with Indian bread or steamed rice. Wash the okra and pat dry with a towel, ready for frying. Meanwhile, place a medium pan over medium heat and drizzle 1 tbsp of oil. Add cloves and cinnamon sticks and fry for 5-10 seconds. Add ginger, garlic and fry until garlic turns light brown. Add onions and continue to fry. When onions turn transparent, add turmeric, red chili powder and garam Masala. Add carrots and continue to fry until carrots soften. Add tomatoes and cook until they are softened. Add cashew-milk or cashew paste and cover the lid for 6 minutes and turn off the heat. After it cools down, blend the mixture without water to a fine consistency. Place a separate vessel over medium heat with 1 tbsp of oil. When oil heats up, add the chopped okra (Bhindi) and fry until they turn golden brown. Now add the blended masala to bhindi and salt to taste. Bring them to a boil and switch off the heat. 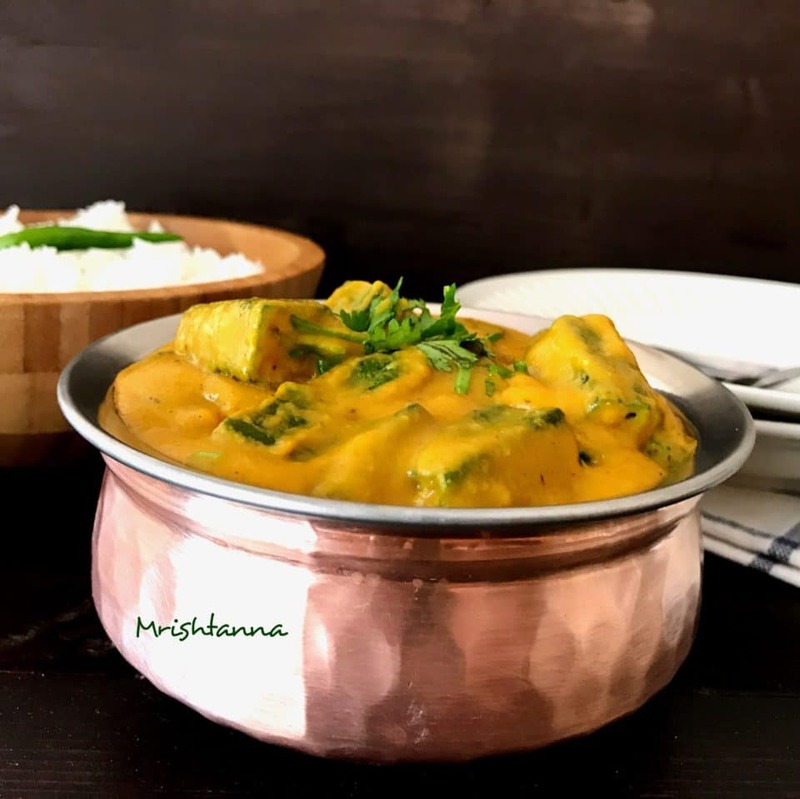 Vegan Okra Curry or Bhindi Masala is ready to serve with steamed rice or Roti. This curry has such a luscious texture 🙂 yum! The okra curry looks so tempting, have to try this recipe. Okra is one of the veggies that I regularly make at home, shall soon try this. Looks a bit similar, though it has gravy. Nice one. I have never prepared okra curry this way, looks tempting! Please do next time 🙂 Thank you! I just made this! Literally the best curry I’ve ever made. Looove the cashew mill in it. Thankyou!! I have never made Indian food before (although I love to eat it). When making this, do you leave the cinnamon stick and blend it in or are we supposed to remove it before blending? Thank you for the recipe! Hi Anne, You should blend cinnamon sticks too. hope you will like this curry!